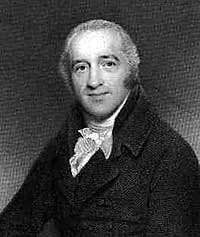 Charles Simeon is thought of as an ancestor of the evangelical movement in the Church of England. He was born in Reading in 1759, the youngest son of Richard and Elizabeth Simeon, His eldest brother died early, his second brother became an MP, the third was a director of the Bank of England. Simeon was educated at Eton College and King's College, Cambridge and became a priest. He was so unpopular that services were frequently interrupted and he was often insulted in the streets. However, he subsequently gained a remarkable and lasting influence among the undergraduates of the university. He became a leader among evangelical churchmen and was one of the founders of the Church Missionary Society. He published hundreds of sermons and outlines of sermons.